The world of meetings & special events has certainly changed in the last few years. As a matter of fact, it’s taken quite a beating, but clearly there continue to be major special events and meetings. For instance, those Oscar after-parties with all that swag still happen, there are still posh weddings, Fortune 500 Companies still hold their shareholders meetings and sales meetings. Right? Retail department stores have major events featuring celebrities who endorse clothing lines or fragrances. But, what about other corporate and non profit events and the rest of the event world? A good portion of major internal corporate meetings – nationwide sales and marketing conferences , for example – have been downsized. Trade association conference attendance is way down in many industries. Educational and networking conferences are having trouble filling their seats. Why? Well, it appears that the conventional wisdom these days – which I feel is downright crazy – is to either stop spending money spend less on meetings and events. Stop spending to plan and produce, and stop spending on travel and the cost of registration. Just like many companies have cut down the marketing and advertising budgets. I don’t have a degree in economics or business, but I do have one in education and that background taught me what is of utmost importance. All of the types of meetings and events that I just mentioned are a form of education and we need to find ways to extend the reach of learning and the opportunities derived from that learning. A company or association – or any brand for that matter – must keep their name out there or soon they won’t exist. For instance, trade associations rely on their meetings and Tradeshows for revenue and membership recruitment. Corporate America must bring their employees together to continue branding and educating from within. Large sales forces must be updated and trained. What to do then? Extend the reach of those meetings in a strategic and cost effective manner. Several major companies have extended the reach of their meetings and now the rest must follow. As it happens, the education community has already led the way here. The answer is either webcasting your meeting, or creating a live hybrid event. This means broadcasting your meeting to your audience wherever they are, or even bringing in speakers and participants from different locations, all at the same time. Attendees can have the same shared experience of a meeting, general session, or workshop. It also needs to be made available on demand for later viewing. Webinars that display just a Power Point plus audio are flat and the viewer can easily get distracted and tune out, or just lose interest. A phone conference tends to be difficult to capture the listener’s undivided attention. There’s no way of interacting easily. There’s nothing visual to focus on. On the other hand, a live webcast of a panel discussion or general session can engage your audience. It can be made interactive as well, with real time Q&A, just as if everyone was in the same room. The attendees get the same benefits, but without the full cost of travel and hotels and their time away from the office and home. With hybrid events, attendees in multiple locations can see presentations participants and speakers, enabling the kinds of experiences that aren’t possible when people can’t fly in from around the globe at the same time. Anything companies do in large gatherings can be done with webcasting and hybrid events. Train staff globally – streamed live & on demand. Increase the scope of your workshops from a small conference room to as many participants as you want. The hybrid event concept is perfect for team-building. Press conferences and product releases can reach a global audience immediately, rather than waiting for that report to come out. If you also need to derive revenue from your meetings or events, there are many ways to monetize. Why not offer a keynote free & charge a fee for sessions or charge a fee to non members of the association. Tis is also an outstanding for sponsor opportunity. Each conference is unique and methodology of fees to virtual attendees would differ. The Webcast must be produced and staged professionally taking into account those attending face to face as well as those attending virtually. This need not be over the top staging, just good lighting and a sound with a simple background. But with a knowledgeable webcast or virtual meeting or hybrid meeting producer /manager you can stage the program so it is easy to see and hear. Sounds simple, I know, but have you looked at some webcasts lately? I’ve seen some strange backgrounds and presenters dressed incorrectly for broadcast. Just like any conference, objectives must be established. In the case of hybrid meetings, there are separate objectives for the overall conference and for the face-to-face and virtual audiences. This will take a great deal of planning and excellent communication amongst stakeholders and out-sourced webcasting producers and managers. The flow of your webcast is critical, even more so than a basic live event. You must stay on track and to schedule. 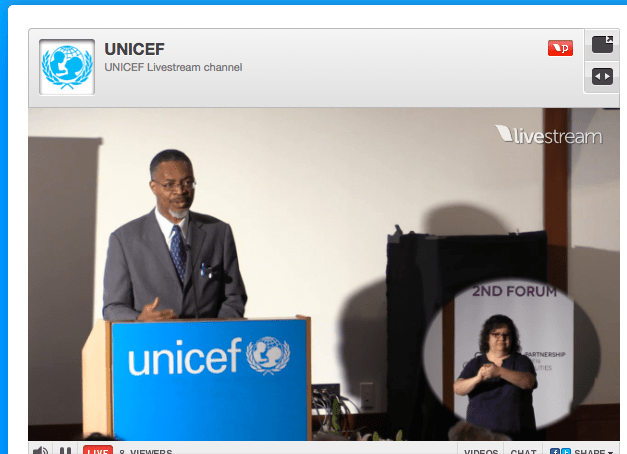 Just as the face-to-face event must be seamless, so must the webcast event. Perhaps even more. My suggestion is to have a Host to interview speakers and key attendees during Session Breaks in order to keep your virtual audience online and tuned in to your event. Part of the pre-planning can include developing games to involve your virtual audience. The caveat, however, is that the procedure and the games must be clearly explained to your virtual audience prior to the conference or event. If these are not explained well, they could fall apart. You don’t have a second chance to keep your audience engaged so you absolutely must be sure that you’ve given the instructions clearly and have answered any questions about the procedure days before the event. If the plan is to have regional or local pods, again, the procedures must be thoroughly explained in detail. Each pod must have a local facilitator who understands the process and is web savvy. As a matter of fact, I‘d have a conference call with all facilitators to be sure that everyone is on the same page. That’s the time for procedural questions. Here’s what I suggest looking for when considering a partner for webcasting a live event. You don’t need to write this down as I will make it available on my blog page. 1- What is their experience in the meetings/events industry? 2- Do they have someone on their team who understands meetings and events planning and management best practices? 3- Does their team have an experienced director and video cameramen? 4- Can they shoot in high definition? 5- Do they have backup equipment on site? 6- Can they broadcast to all levels of computers as well as to smartphones and tablets? 7- To how many virtual attendees can they broadcast? 8- Can they broadcast internationally if needed? 12-Is the company full service rather than one that does just one thing? The full service background gives them a better overview of how a meeting is planned and produced and therefore can help you with the overall process making this successful. I’ve hit upon just the highlights of streaming an event live as well as on-demand viewing. But, there is much, much more to this, but don’t let it intimidate you.